The 00 has intimate practice and songwriter written all over it. Compact size, impressive build quality, sound and price – and the USB output is very handy. Might be too specialist for some and that plastic output plate worries us for prolonged stage use. Unlike some USA acoustic makers, you certainly can't accuse Martin of ignoring the beginner, student or simply small-budgeted among us. Although from 22 new models and limited editions released so far this year, only four have three-figure prices, it's those that will be unquestionably the biggest selling. Ed Sheeran's X Signature and the slightly down-sized Dreadnought Junior have certainly grabbed the headlines, but two other X Series models, released earlier this year at the Frankfurt Musikmesse, are far from insignificant. 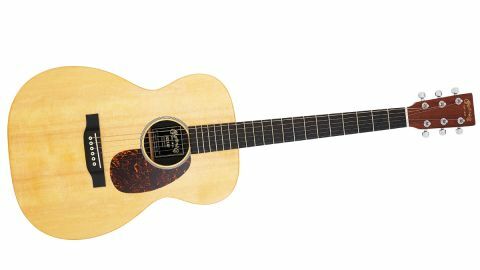 The non-cutaway 00X1AE, one of three 00-size models released this year and one of only seven currently offered, enters Martin's start-up range as the smallest- bodied full-scale guitar. It's an electro with USB recording outputs and retails at a tidy £559. "There's plenty of volume - and quite a direct, strong and strident character - and again, if you dig in." Here we have the high-pressure laminate (HPL) back and sides with its highly realistic-looking mahogany-like texture and coloration paired with a multi-laminate neck made from around 37 slices, at its widest point, of birch - like thick, just under 2mm, veneers stacked together. The guitar is not bound; there are no fingerboard inlays (just small white plastic side dots) and soundhole decoration is simple - the 00 features single-ring black Boltaron and white fibre. The 00 is vintage-toned, and all the better for it, we feel. But while these might seem bare-bones, like the Dreadnought Junior, the quality of the build is exceptionally high: crisp, clean and sharp. The 00 retains similar proportions to the 000/OM but is down- sized from a 492mm length and 387mm width to 479mm x 338mm. It also has a 'Modified Low Oval' (20.8mm deep at the 1st fret, 23mm at the 12th). "The 00 is vintage-toned, and all the better for it, we feel." While there's a reassuringly solid feel to both guitars, this plastic side plate doesn't fill us with confidence stage-wise - it's fine for the battery holder and indeed the USB output, but we'd really prefer the jack output to double as the base strap button, which here, in Martin style, is a plug-in plastic type, like an enlarged bridge pin, that is simply a push fit, albeit firm, into the base block: conjuring visions of straps falling off and wrenching out jack sockets at your nerve- ridden open-mic slot. The 00 sounds thinner than, say, the recently-released GPX1AE, although the pair do share common ground in the upper mids and highs, very Martin-like, beautifully ringing, zing-y and shimmery. There's plenty of volume - and quite a direct, strong and strident character - and again, if you dig in. Amplified, the sound is a very accurate representation of the 00. With a little onboard help, using the tone to subtly roll off the zing, and with a little outboard help to thin the mids and clean things up a little, strumming in lower positions, we'd be happy enough. Although obviously a little piezo-like and unnatural in the midrange, and on higher-fret excursions, the sound really isn't a million miles away from our reference Martin Dreadnought costing over twice the price. Using the USB outputs into a simple DAW such as GarageBand, you might be surprised at the results, especially for arpeggiated parts and strummed rhythms when double-tracked and given a wide stereo spread. Lead lines are less convincing and do sound a little piezo- like, but that's the same when plugged into a PA or amp. If we're honest, we've been a bit snooty about Martin's seemingly so synthetic X Series. The fact is, this is a superbly built and although we have some concerns about durability, the thing that sways us is the easy playability and surprisingly good sound for live or recording duties (with or without the USB feature - it's there if you need it).